The most affordable slate by Barnes & Noble has just received a refresh without jumping over the US$50 sweet spot. Its specs now include 16 GB of storage space, a "vivid and bright" 7-inch IPS display, as well as up to 7 hours of battery life while reading, watching videos, and browsing the web. Introduced in late 2016 and plagued by various problems ever since, the 7-inch NOOK Tablet is now bouncing back with more storage and — apparently — no other big improvements. However, the US$49.99 price is not bad at all for those looking for a basic Android slate for reading books and browsing the web. The new NOOK Tablet probably uses the same MediaTek MT8163 processor or one of its successors, but we cannot say this for sure because the official product page does not provide this kind of information. 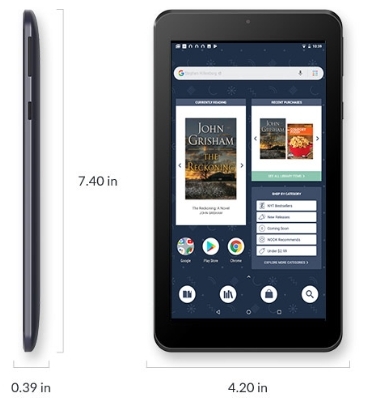 However, there are a few highlights that should bring in some customers, such as the 7-inch IPS display with 1,024 x 600 pixels, twice the storage space provided by the original NOOK Tablet (16 GB vs. 8 GB), and up to 7 hours of autonomy. The cameras are, to be honest, unusable - the front VGA image snapper and the rear 2 MP sensor were nothing to be proud of a decade ago and they are simply pointless even now. However, in good lighting conditions, this slate might be used for video chat sessions or to take some sub-mediocre photos. Obviously, the Barnes & Noble NOOK Tablet shines thanks to its vast library of eBooks, with carefully curated selections for kids and adults. When needed, more apps and multimedia content can be acquired via Google Play. Those interested can already acquire it online or from Barnes & Noble's brick and mortar locations.